I’ve been under the weather, so I spent the weekend reading, napping, and watching Netflix (anyone else get hooked on The Crown?). The view was so peaceful from my sunroom that I snapped a few photos to show you. It isn’t a lot of snow, but just enough to look pretty. I also spent a lot of time thinking about the past year, which was a tough one for me since I hurt my back about six months ago. For years I’ve done Zumba or other aerobic workouts first thing in the morning, but I could no longer exercise that much. I went from feeling fit and strong to stiff and tired most of the time. Add chronic insomnia from the pain and you get the picture. One of my main resolutions is to try yoga in order to rebuild my strength and flexibility in 2017. And to be patient with my progress instead of trying to hurry myself along, as I’m often tempted to do! I just bought a book (Amazon affiliate link) about using it to help your body heal and have been looking up “yoga routines for beginners” on YouTube. Some of the videos have been great, but I’ve also had some laughs over the moves they expect newbies to perform. “Just pull your right leg straight up and hug it against your ear!” Sure, why not? Ha. One thing about being sick or in pain is that it forces us to slow down. You can’t go through life quite as mindlessly when your body is hurting, can you? It makes you stop and pay attention. In a weird way it’s a gift because it makes you focus on what’s really important. It’s a Snow Day at My House–Come On In! Yoga with Adrienne on YouTube is the BEST! She’s so relatable and does a LOT of beginner routines that are challenging but still realistic! Thanks, Kelly! I’ll look hers up! I also like Jason Crandall, who does Yoga Journal videos. I think you can find them either on the Yoga Journal site or on YouTube. He’s a wonderful teacher and most of his routines are great for beginners. I second Yoga with Adrienne. I started with her Yoga for Complete Beginners last February and did it for a couple of days. Then I followed with her Yoga for Beginners 40-minute workout for the remainder of the week. After that I launched into her first 30-day challenge. Then I did her second 30-day challenge. Then I just kept going. I was planning to start her newest 31-day challenge that started January 1, but got hit with a bout of vertigo. I should add that I am 60-years-old. She is the best! I stopped over to see your beautiful sunroom but I am also glad I did for the yoga advice! I have been having back and neck problems lately so I will take any help I can get. I have had problems on and off my whole life but lately, it has gotten worse. I am going for an MRI on Wednesday and although I am terrified of it, I hope to get some answers. Sorry to hear your back has been bothering you too. I understand how you feel and it really does just force you to slow down and think. Enjoy your beautiful room and views! I’m glad you are already seeing a difference in your back pain, due to yoga. After 18 years of a daily yoga practice (and I love it more now than ever), I do feel like I should mention one thing, though. At some point in the near future I would recommend that you try a good class. Do some research and try to find someone in your area who does an alignment-based class. It will help you to know how you are supposed to feel in a pose, and what could be harmful. It can be hard to tell when you are doing a video by yourself at home. I’m the first to agree there are tons of great yoga videos out there (Seane Corn is my personal favorite – and is alignment based), but it can be so helpful to have some “hands-on” background. Yoga is SO good for you but you can also hurt yourself if you’re not doing it safely. Please don’t let any of this turn you off or scare you away from yoga!! Just take it slow :D. And ENJOY. Sounds like a good idea. I’ll start asking around — thanks, Karin! Hi Calpyso: please don’t be nervous of MRI’s!! Look at it as a “rest”! lol! I have had a fair number due to chronic back, leg and neck pain. They are noisy but that’s all … the older machines used to be dark and, therefore, feel much more confining. Here in Ontario (Canada) they give you a buzzer type of thing to hold in case of any emergency such suddenly wanting to use the washroom facilities or some such thing. Nothing to fear at all and painless!! I’m new to yoga, too, and the Asana Rebel app has been amazing! I’ve been using the free workouts for about a month now and I love it. Good luck!! I didn’t know about that app, so I’ll check it out — thanks, Kailee! It’s fun to see your sunroom because 1) it’s so pretty, and 2) we are remodeling ours and your look is my goal. As for yoga, when I practice it faithfully my body feels 35 again (I am 58 and have some minor arthritis in my knees and ankles). It’s really tough at first, but if you do the best you can each time, after awhile you’ll be amazed at how much more you can do! 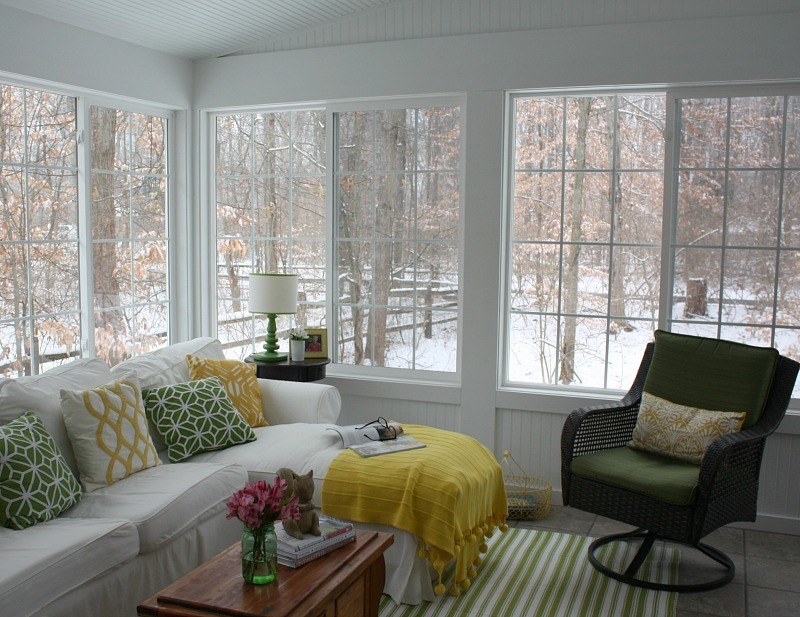 Your sunroom looks lovely in the reflective light of a snowy day! Looks like a perfect place to relax with a book or watch nature with a cup of coffee. I have a very small second bedroom in my 1920s era apartment (so small that my landlord actually advertised it as a “half-bedroom”, if you can believe that) where I have a twin-sized bed set-up like a daybed. It’s a nice little place to retreat to. Glad to see you back! I, too, suffer from chronic (tummy) pain, + my sister’s been nagging me to do yoga for years. Let’s do this! I have a sun porch and enjoy it as you described. I am sorry for those who do not have this room! We enjoy the wildlife and this porch makes it available year round. I would sit in that sunroom all day! And yes, “The Crown” is the best! Check out the website and YT channel Namaste TV for some free episodes of their popular yoga tv show. Seasons 1 and 2 are more for beginners than seasons 3 and 4. Also, there are some episodes on YT of a show called Yoga Zone that also was a tv show. Yoga Zone is better for beginners than Namaste Tv is. I didn’t know about that channel, so I’ll look for that. Thanks, Kelly! I’ve been asking around to see if I might find a good class or instructor in the area. My chiropractor has been pretty firm about telling me what moves I can and can’t do and teaching me exercises to do each day, so I’ll see if he recommends anyone for yoga. Thanks, Julia! I love your sunroom. Yoga is the best – for body AND mind. I go to classes, but have heard great things about Adrienne on Youtube, too. It is an addictive slow burn. Sometimes I feel it is only yoga that’s keeping me sane. All the best. Cindy – I feel the same way. We have a saying in one of my classes “I Practice Yoga to Burn Off the Crazy”. What beautiful scene to make you feel better! Just curious but what the dimensions of your sunroom? Also yogatx on YouTube has some great videos for newbies, they have some great core and back videos! Happy healing! I haven’t seen yogatx on YouTube yet, so I’ll check ’em out. You guys are all giving me such great suggestions. Oh, and the sunroom is 17 x 18. Thanks, Kristin! I am SO sorry about your back and sleeping issues. I hope that the yoga and the wise advice of your readers offers you some solutions! In the past two years I fell and broke my knee, ankle, and severed my ACL; had ACL repair surgery and then fell again breaking both wrists and elbows! (Just a few months before that wedding I told you about!) I now seem to be developing arthritis in several locations where I broke bones. In other words…I understand your pain! Your beautiful and cozy sun room looks like the perfect place to pamper yourself, which I believe is something you need to do a little more of, my friend? What a gorgeous view! It looks very peaceful and the snow makes it that much better. I hate to hear you’ve hurt your back. It’s easy to do the older we get. I started doing yin yoga almost two years ago. It’s been a lifesaver and actually strengthened my back and helped with all over flexibility. It’s unlike any other yoga because you hold poses for 3-5 minutes and stretch your deep connective tissue. It’s not hard, but holding the pose and being still is challenging in the beginning. All poses are down on the mat, not standing.. I take yin class in a studio and haven’t done any videos yet. I always enjoying when you share your sunroom Julia. It’s cozy and cheery at the same time 🙂 Particularly so with a bit of snow on the ground. Nice you have a place to relax when you’re not feeling well. Hope you continue to have a strong recovery. I use an app called Yoga Studio with a nice variation of levels. I also practice Tai Chi which is great for strengthening, toning, balance and meditation. Happy 2017 to you and yours! I’ll have to look for that app — thanks, Gina! I was going to rec yoga as soon as you mentioned your back injury (so sorry)! For a beginner I really would recommend finding the best studio in your area and taking beginner courses in person. Not only do you get individual attention and help with correct posture for poses, you get a real sense of love and care. From there trying apps and videos to supplement your practice is awesome. Best wishes! What a gorgeous space! I would spend ALL my time there! I’m hooked on The Crown, too. I binge watched the first season, except for the season finale. I’m saving it for some day when I really, really need it–know what I mean? I read that Claire Foy isn’t going to stay on after Season 2. 🙁 Who can replace her! I agree, it’s hard to imagine the show without her! I’m going to miss John Lithgow’s Churchill next season, too. That is so beautiful! I could definitely relax and unwind there easily every single day! I would love to have a space like that! I will always be a mediocre yogi (no matter Where you’d expect my leg to be by now, lol!!) But boy I think it is some healthy stuff. Best to you! Love your sunroom space. Every January for the last few years she’s done a 31-day challenge (this year it’s called Revolution). I wouldn’t recommend starting there because it’s a little more challenging, but she has TONS of videos to work on various aspects of your physical health. Just take it slow and one day at a time. I’m still no pro (my heels only sometimes touch the ground in downward dog), but I now feel better when I do yoga than I do without. Your sunroom is so pretty. Enjoy your snowy day! I hate to hear that you’ve had problems, and I hope that you can find some yoga sites that help. Have you tried Pilates on the Reformer machines? So many back patients around here have seen wonderful results, and several of them pair Pilates with yoga. I’m going to look up Yoga with Adrienne! I’m trying to recover from surgery and frozen shoulder. Physical therapy isn’t for sissies! I haven’t tried Pilates, but I’d love to. I’ll have to look around to see who’s doing it in my area. Thanks for the suggestion! is that a carved squirrel on your coffee table? can you tell me where i might find one like it? it’s adorable. Isn’t he cute? I’ve had him forever and can’t really remember where I found him. HomeGoods, maybe? Sorry you were sick but what a great room to recover in! That is such a beautiful room Julia! I would never want to leave either. Just georgeous! OoOOOh love it Julia. How ’bout one of those big giant thermometers inside the room, so we can see the difference between that frigid-looking outdoors with the cozy indoors? What a great color combo, what made you choose those? You’re very skilled, I would not have thought to use green, yellow and white at all but look what it does! Don’t know if you have a Roku, but I believe there are some Yoga channels (free?) you can add. I am not a licensed physician, but my advice “Never get back surgery” (to fix your back). Every single person I know who’s had it is worse off. Even for compressed vertebrae. cheers thank you for sharing your house with us! I would like to strongly recommend finding a personal trainer, first. Our local fitness center has one that after watching me do a few exercises, was able to target my weaknesses, and make me feel confident that I wouldn’t injure myself. She teaches Yoga, Pilates, Strength Training, you name it. Personal trainers have mandatory continuing education and are dedicated to every aspect of health and fitness. Well worth the money. Hi Julia, would you please tell me what brand heat source you have behind the sofa? I have a similar “sun room” that was formerly a screened porch, but our “zoning” prevents us from having had hvac added to this space…right now, all I’ve got is a plug in space heater, and it’s too cold today, to get it warmed up enough. Thanks! Hi Thea! I’m not sure what brand it is. It looks like one of those heaters you see in a hotel room, built into the wall. It’s nice to be have separate heat/AC in the sunroom because most of the summer we have the windows open out there (and don’t want to cool it) and in the winter I only turn it on when we’re out there. Julia, let me add my good wishes for 2017 to be a year of healing and good health for you. I’m one of your fans who has missed your regular posts! Your sun room is lovely, and I feel “green” about the snowy view! Have you seen the Cote de Texas pieces on the historic houses and sets of The Crown? Between those posts and the costume posts that Tom & Lorenzo did, I feel like I got a master class in costume and set design. I feel for you Julia; I love, love, love zumba and tennis but as I get older (I’m 61) I found I can’t do as much as I want because it leads to sprained ankles. Yoga and other exercise are good, but just not the same. However, one has to accept their limitations and learn to find new loves. I hope you will find a way to control your pain and still be active. Also, I love your posts, and your sunroom. We have a three season one that is much smaller, but we enjoy it so much. We also have a three season porch on our home’s north side, which is really nice in the summer since it’s cooler there. Every home should have a room like that! Yoga helped me tremendously. There is a studio across the street from my office so I am very fortunate since I find the community of practitioners as healing as the yoga itself. I can imagine the joy of an afternoon, reading and napping in your beautiful sunroom. I enjoy your posts very much thank you for the “dreaming” breaks you provide. Julia, I hope 2017 is the year of your healing. Women/Mothers often forget to put ourselves first and foremost and our self-care often slides down the list of priorities. I have hip bursitis and when it flares, it’s painful and debilitating. I found yoga has been a god-send for me in my healing and acceptance of my health situation. I know I should feel blessed because it could be worse and there are others whose health situation is much worse than my own. On the dark days when I’m stuck in side because it’s painful to move, I work on my self-care/self-love with a book and my journal. Thank you for sharing your beautiful sunroom. Be good to yourself. Where did you get that super cute yellow throw blanket w/ the pom-poms on the foot of your chaise of your sofa? A friend of mine spotted it on clearance at Meijer years ago for $4 or something and grabbed it for me. She thought it would be perfect in my new sunroom, and she was right! I just wish I could get a new one because my cat loves playing with the pom-poms and has pulled a few of them off. I strongly agree with everyone who suggested you try to find a class for beginners AND question the teacher about how he/she evaluates the students – particularly if you’ve had an injury. There are some yoga positions which may be contraindicated for some situations and, though a teacher may not possibly be able to know each student’s possible situation, a really good teacher will ask whether anyone has “knee problems or back problems, etc.” and suggest modifications for doing the posture. I’m very lucky to have a teacher who is excellent at doing this but I’ve tried classes with many who simply didn’t have the experience or the mindset. And even if you are perfectly healthy with no known problems, your body simply may not be put together to perform certain poses and you may always need to do some modifications. Not at all to warn anyone away because yoga can be tremendously healing! Your sunroom is wonderful and healing as well and will be even more so as we head toward spring and summer. I love the green and yellow. I always love to see your sunroom. The green and yellow colors are so energizing and I like your windows. We’re working on updating our sunroom that I hope to be as charming as yours someday. Feel better soon. I love the yellow, white and green of the room. Very pretty! And the chest as a coffee table is just the perfect size. Really all very lovely. Im glad you were able to take the time to sink into Netflix and just enjoy your space on a winter day. I started doing kundalini yoga about twenty years ago and began my practice with an instructor, eventually going solo. It incorporates a quite a lot of breathing exercises combined with stretching and asanas. I love it, but everyone has their favorite and I’m sure with time, you’ll find one that suits you. Glad to hear you’re already having some success. Keep it up–you’ll be glad you do! Love! Thanks for sharing about your yoga practice. And your sunroom is as gorgeous as always. While moving large dead trees in Northern Michigan last September, I pulled my back out to the “overnight in a hospital” degree. Stupid move. I did more damage the following month moving a huge mirror. In my youthful days, I would just keep going and it would eventually repair itself. I’m finding that not to be the case this time around and I’m so frustrated! I have painting to do and rooms to decorate and anything I do slightly wrong brings the pain right back. While I hope you recover soon and your story makes me realize I probably have to “participate” in fixing mine, I find a little comfort in seeing that others have had the same thing happen and there can be light at the end of this tunnel. I didn’t have much sympathy for bad backs until I got one of my own. Karma! I love your porch and envy the time you get to sit there, read and enjoy the view. I love the little wooden squirrel who sits with you, as well. Funny thing – I bought one just like him and my husband made fun of it, so I took him back; something I NEVER do! After seeing yours, I know I should have kept him. Ah well…A reason to go back out to HomeGoods and hunt for a squirrel! Stay warm, enjoy your downtime and hope you’re at 100% soon. 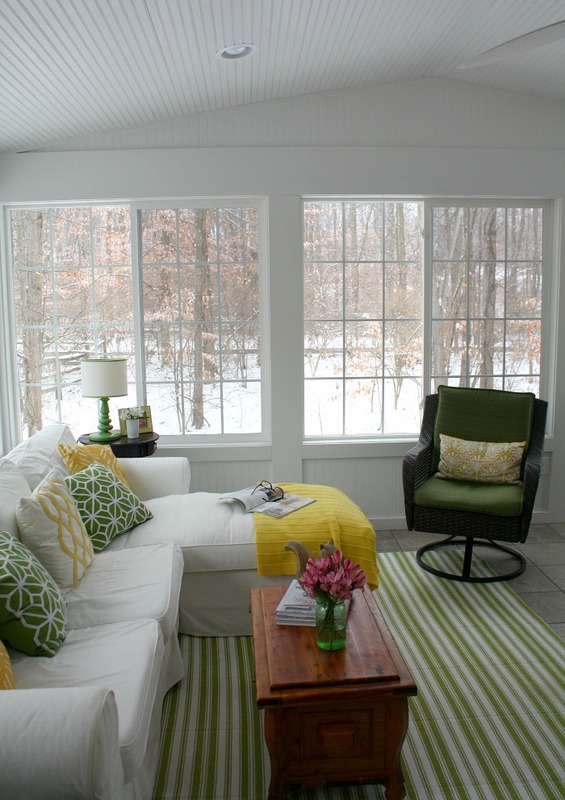 Julia, I’m green (and yellow) with envy for your sunroom! I’d love to have one one day. I hope you will get better soon. So sorry to hear about your back. I have been suffering from back issues for years and then got in two bad car accidents in two years on top of that! I do Pure Barre classes 5-6 days a week with some small modifications to accommodate my back limitations. You may want to check them out. Hope you feel better soon! Enjoy your beautiful sunroom!! I haven’t heard anything about the Pure Barre classes, so I’ll have to look them up — thanks, Renita! julia, so sorry about your back! I’ve worked out for years, hard, but have recently been experiencing ongoing pain/stiffness everywhere. Yoga, when i actually take time to do it, has been a big help in alleviating a lot of that. I second Adriene on YouTube. Also, The PsycheTruth channel (you have to get past the name & the homemade/new agey look :))has a lot of good, easy-to-follow yoga workouts. 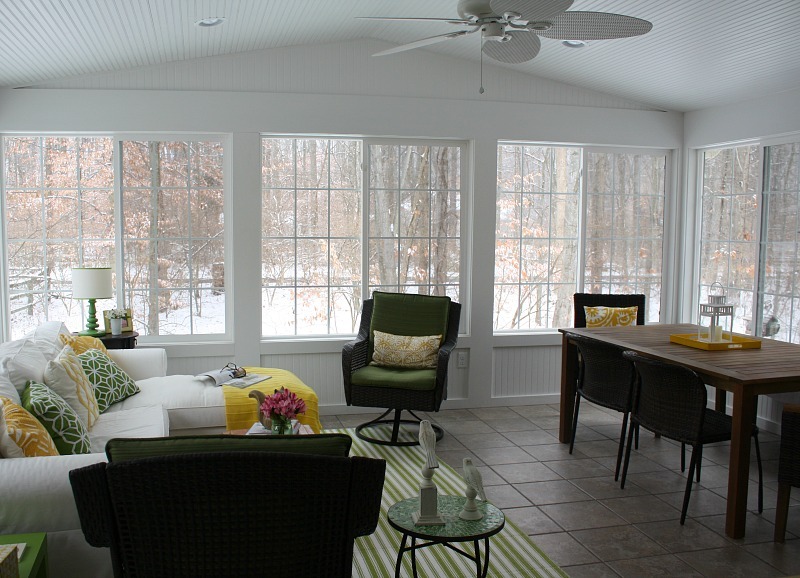 always love seeing pictures of your cheery sunroom! I am so sorry that you are not feeling well, but what a lovely room to recuperate in! I have had the stomach bug for the past few days and actually ended up on the ER because I was so dehydrated. Then as an added bonus I have a head cold. I haven’t been sick in years and I am not a very good patient. haha I used to work out religiously but in the last few years I haven’t been as faithful as I once was. I am 54 and don’t have any weight or health issues but I have been sitting behind a desk for years and that has made me stiff and my muscles are not as toned as they used to be. I wanted to try yoga and just happened upon Peggy Cappy a few years ago on our local PBS channel. She has been teaching yoga for many years and some of the students in her videos are over 60 and in amazing shape. There are no crazy moves and she shows you several different ways to do the exercises. I bought a three part series online from Wal-Mart entitled Yoga for the Rest of Us – Essentials for Every Body. I would imagine they are still available if you are interested. I hope you feel better soon. That sounds great, so I’ll look her up — thanks, Angie. Hope you feel better soon! There are some nasty viruses going around this time of year, that’s for sure. Love the view! Miss the snow days up north. I loved The Crown. Can’t wait for The Crown and Outlander to vime back on. I read that the characters playing Queen Elizabeth and Prince Phillip are only going to be on the show for two seasons. They are both wonderful actors. It’ll be interesting to see who they cast as the older Elizabeth and Phillip but hard to imagine the show without Claire Foy and Matt Smith. They’re so good! Your sun room (and your furry four-legged companion) are the perfect place to recuperate & regroup! Thanks for sharing, and hope you are feeling better soon! For anyone with back pain (or other osteo pain): I hurt my back a few times over the years, but in 2014, I hurt it doing some work and was in pain for TWO YEARS. Every day I dealt with pain, be it somewhat mild, to debilitating. I was taking either a muscle relaxer or Vicodin every night. I lived on Aleve during the day (all of which is bad and I did NOT like doing). No one seemed to know what was wrong. I couldn’t afford an MRI, and one doctor thought I might have ruptured discs. A trip to Physical Therapy for a different, yet, it turns out related issue, and the therapist wasn’t convinced it was ruptured discs. Fast forward to last year and I learned of the Osteopath. This treatment saved me and I cannot say enough good about it. It is generally covered by insurance and is a mix of Orthopedic doctor with physical therapy, massage therapy, and *mild* chiropractic. My very first appointment, during the exam, in less time than it took for me to cough hard three times, my biggest issue that was causing me such pain for those two years, was fixed!! My left hip had basically gone out of place and was 1 inch lower than my right. Something X-Rays hadn’t seen and other doctors and therapists hadn’t found or diagnosed. When she said she fixed something, I thought she was nuts because I felt nothing happen. When I sat up at the end of the exam, I thought something seemed different, but I’m a skeptic and figured the pain would be back and I was imagining things. That pain never came back. While I still have issues with my back, things are SO much better and would never have been fixed had I not taken a chance on this type of doctor. I just need to continue stretches to let things loosen up after two years of being stressed when my hip was out of place. She also confirmed, via exam, that I do not have ruptured discs. I did not respond with pain to the types of manipulation that would normally cause pain had I had ruptured discs. No MRI needed. Wow, what a story! That’s really amazing. So happy you found something that worked, Joan! Hi Julia, I also hurt my back and struggled with pain and recovery. I have practiced yoga for many years but even that wasn’t helping. I then discovered a style called Yin which works on the connective tissue of the body and not so much on the muscles and balancing. This has improved my back immensely. There is no ‘one size fits all’ but please investigate it and give it a try. It won’t make anything worse as its a slow style with long holds. Good luck. Loving your blog by the way. I’ll look into that! Thanks, Sharon! Hello from Ontario, Canada. I did a double take seeing your sunroom because it was just like looking at the one we had in our second from last house. That house was in mid-north Ontario in an area called the Muskokas similar to say, the Catskills, about 2-1/2 hours north of Toronto. Even the back yard looks similar! I’m sorry to hear you’re in pain and hope you improve soon. I’ve been in chronic pain for 24 years. I saw some of the best in their field for the first two years with no proper diagnosis. Quite by accident, a doctor (in another room) overheard me with the specialist, stopped me on the way out of the building and gave me the name of an osteopath. He diagnosed my problem within five minutes!! It took a few months of treatment to see improvement as the two years (of not being diagnosed and given the wrong exercises) caused some problems. Even though, I vastly improved, I still had one nagging pain so saw another much-recommended pain doctor who, unfortunately, made me worse, thus the 24 years of pain. How I wish I had stayed with that Osteopath who has since retired!! They are very, very hard to find where I live! I wish you luck; you just need to find the right fit with a professional BUT go with your gut! If something (exercise, for example) feels wrong or seems to hurt more, question it! You know your own body best!! One request of your readers, Julia: I had two knee replacements so I can’t kneel anymore. Does anyone know of yoga that can be done without kneeling? Thanks for any help! Love your comfy, cozy sun room! Wish I was there to snuggle up on your couch with a good book and some hot cocoa! Actually, with your back, that is what you should be doing! I hope you begin to feel better soon, Julia. I have a vintage Air Stream trailer in my back yard. It’s a 1966 Avion, and that company was bought out by Air Stream. They are made with the same high quality and appearance. I hired an electrician to give it all new wiring, and a retired handyman who lives next door fixed up the interior. I took out the old dangerous heating unit and replaced it with a radiator-look space heater, and added an a/c unit on top. Finally, I decorated the whole place with a 60s vintage look. Since it came with a pink stove and sink, I chose colors of pink, orange, yellow and green to decorate. I made curtains with vintage cloth I purchased online, and added long yellow fringe at the bottom. Another handyman I hire for 3 hours every week built an L-shaped deck on the front door side over the course of a year. I sit out there in the warm evenings and enjoy the sunset over the mountains. Recently, I started using it as a studio to work on my painting and crafty projects. My son gave it the name “The Art Stream”. It’s such a happy, sunny place! I could easily spend all day every day in it. I made a video tour of it, in case you’d like to see it. Wow, that sounds amazing! We’d love to see the video, so feel free to post the link when you get a chance. Thanks, Karen! So sorry to hear you’ve hurt your back. See if you can get your doctor to write a prescription for physical therapy. That will get you off to a really good start and they can hone in on what exercises would work best for you going forward after PT. Thanks, Maria! I’ve been seeing a chiropractor and it’s been very helpful. He’s given me daily exercises to do, etc. I’m feeling much better now than I was last summer but still have a ways to go. Namaste, Julia. So glad yoga has given you some relief for your back issues. Sorry you’ve been down. Be kind to yourself & trust that all will be healed in time. ? I am originally from a snowy area now living in a warm climate. I never missed the snow until now. Thanks for the vision.